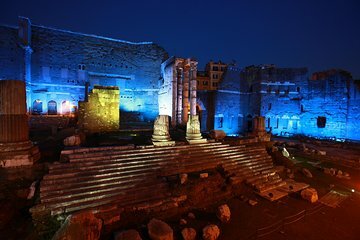 Descubra o encanto de Roma à noite em uma excursão de 3 horas à noite em Segway pelas atrações artísticas e antigas da cidade. Fuja das multidões diurnas e aprecie a beleza dos monumentos iluminados enquanto desliza em uma scooter elétrica por praças românticas e ruas sinuosas. Cobrir muito mais distância do que caminhar para admirar destaques da cidade eterna, incluindo a Piazza Venezia, o Coliseu, o Panteão, a Fonte de Trevi e a Piazza Navona. Edi was fantastic!!! Very knowledgeable and funny as heck!!!! It was only the 3 of us so we had a private tour. We were riding for close to 4 hours!!! Totally recimmend him. We plan on taking him again when we bisit in 2018. What a fun way to see the highlights of Rome! Vicki was fantastic. It was an experience we will remember forever. Thank you, Vicki! Many people stopped us along the way to ask where/how they can do a tour like this. Book now and you won't regret it. Très belle balade mais entre les anglais et 1 français et bien le français se sent un peu seul avec son guide audio . This tour was great! Guide was great and informative and the views could not have been beat. I do wish we had gone to the colosseum, which was not included due to distance. The segway was fun and easy to learn however slightly hard to navigate on the crowded streets. The tour was great fun and a different way to see Rome. Very good tour guide that was passionate about local history and Roman life. If you have teenagers this is a must do. It's a great way to get around the entire city in the cool of the evening. Highlight was the colosseum and a great view of the forum from high above.